Gary Bigeni’s Spring/Summer 2012 collection features variety of bright colours and clashing bold prints. Its all about a strong and confident woman. 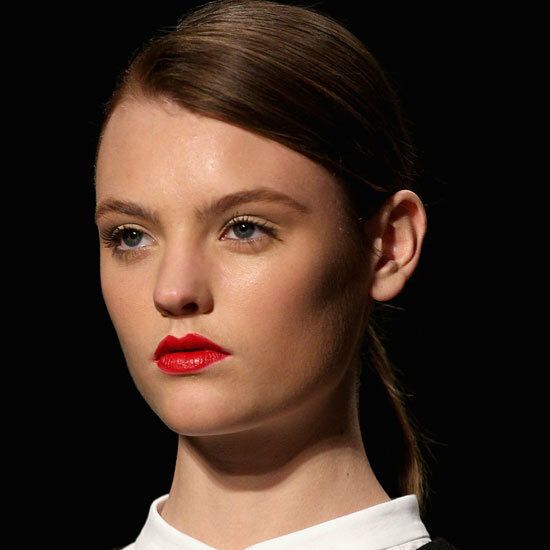 So Kate Squires from Napoleon Perdis created makeup to express this idea – flawless glowing skin and a bold red lip. Super sleek hair with a pony tail reinforced the show’s concept. The lipstick was applied straight up, without liner. Chocolate brown mascara was used to define eyes while keeping the lip away from being too seductive and taupe contouring to add structure to the face. Kate used DeVine Goddess Lipstick in Aphrodite. I think this look would be as perfect for the day as for night. Aurelio Costarella doesn’t really follow trends…. So does the makeup and hairstyle that had everybody talking. Two ponytails were knotted together at the occipital bone to create the final hair look at Aurelio Costarella. To complete the style white paste (chalk powder mixed in with a Goldwell gel) was brushed over models’ part. You can see there is Christina from Hair Romance doing a great job snapping the looks. James Molloy from MAC created a 1920s gothic-inspired look. There were no graphic lines, instead it was meant to look like a lighting effect. To achieve this, it took three layers of eye shadow: first a taupe was applied all over the lid, then a cream-base moss green was patted on top, and finally a gold-green pigment to finish the look. This smokey eye look I’d wear for a romantic rendezvous or dinner. Maxi dress is a must. Johanna Johnson’s Spring Summer 2012 collection is all luxurious sophistication. So Nigel Stanislaus from Maybelline NY echoed this idea in the makeup he created for the collection: “It’s luxury, there’s lots of gold, lots of black,” he said. He even insisted on a last minute change of a lip color – out with red and in with Make Me Pink Maybelline NY Color Sensational instead. Golden brows were created by prepping them with Maybelline NY’s Baby Lips lip balm to get the gold pigment to hold. In Johnson’s collection, most of the looks were complemented with embellished headpieces so the hairstyle was kept relatively simple. Sleek with two small waves up at the front and brushed-through looser waves swept over one shoulder. Louise Van De Vorst done for the Johanna Johnson’s show. This is such an amazing post, thanks for sharing the photos and the guide on how to recreate some of the looks!! follow eachother with GFC + twitter + FB + Bloglovin? The make-ups are all so pretty in their own way. Love them.